Arnie the doughnut is so proud to be a doughnut and excited for all that must await him once he is chosen by a customer. Little does he know... donuts are made to be EATEN! When he finds this out, he is shocked and mortified, and will do anything to convince the man who purchased him, Mr. Bing, to spare his life. Together, the two of them try to come up with something else Arnie could do other than be Mr. Bing's treat. The options they come up with are hilariously improbable, and the two are just about to give up when they stumble on the perfect solution--one that saves Arnie's life and leads to many happy times together. As in her other books, Keller's pages are brightly colored and packed with funny little creatures spouting funny little puns and comments. This book makes for a fantastic read aloud, but be prepared for the students to plead for you to stop at each page and read the funny little comments. (Don't worry--they are so cute and funny, you'll want to!) Put this book in your class library so they can pour over it individually. For kids in preschool to second grade (most of the kids in the intended audience), this book will need to be a read-aloud rather than for individual reading, as the reading level will be too high for them. Most third graders should be able to read this book on their own. Below are some spreads from inside this book, and you can see that they feature the central story in larger font plus comments and funny blurbs in a small font scattered throughout the page. The result is a fun and kid-friendly illustration style. Your kids will LOVE this book! Although the solutions they come up with are silly, Arnie and Mr. Bing are very creative in their efforts to solve their problem. Point out that both Arnie and Mr. Bing threw out a lot of suggestions, even very silly ones, before they finally stumbled across a creative solution that worked for both of them. That's part of the process of creative problem solving! The suggestions that Arnie and Mr. Bing come up with for Arnie to do instead of being eaten are both hilarious and perfect for an exercise in visualization. In certain parts (mainly with the suggestions on what Arnie can do), have the kids close their eyes and "make a picture in their minds." Ask students to describe what they are picturing after every few options. 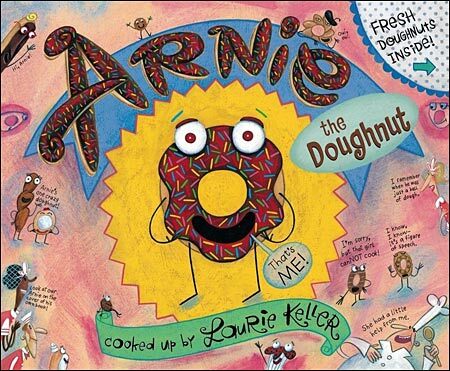 Activity Idea: "My Day with Arnie the Doughnut Dog"
Give the kids each a mini-book (blank paper stapled together) and have them draw and write the story "My Day with Arnie the Doughnut Dog." Remind them that stories have beginnings, middles, and ends (and maybe even have them use a 3 column graphic organizer to lay out their story before making the book). Talk about possible beginnings ("On my day with Arnie we went to the circus.") and possible endings ("We had a great time at the circus.") Then set them loose and wait for the cute and creative results. Okay, this isn't an activity, but.... if you end of loving cute little Arnie, maybe consider getting an Arnie the Doughnut plush.